Truth About Turmeric: Does It Really Work? The Promise: A Stronger Heart, Balanced Cholesterol, a Sharper Brain, Youthful Energy and Pain-Free Joints—Does It Deliver? If you think that inflammation is something that only happens when you're injured, or is simply a minor annoyance—you're making a big mistake. Many experts now believe low-grade systemic (or "silent") inflammation is a major risk factor for a host of health concerns. Of all the health issues associated with silent inflammation, perhaps the most remarkable are those related to heart health. Most notably, extensive research has shown that elevated levels of an inflammation marker called C-reactive protein (CRP) is an indicator of long-term cardiovascular risk in people with no prior evidence of cardiovascular issues. This has led researchers to conclude that controlling inflammation is at least as important as keeping cholesterol levels balanced when it comes to maintaining your heart health. [4,5] And this new concept is nothing short of revolutionary. In addition to increasing the risk of heart trouble, silent inflammation has also been identified as the root cause of many of the common signs of aging, from diminished brain function to painful joints, to low energy levels and more. In short, silent inflammation can make you old before your time. If you want to keep your heart pumping strong and your blood pressure healthy...If you want a razor sharp brain as you age...If you want flexible and comfortable joints...Or if perhaps you're dealing with nagging health problems that no one seems able to solve, please keep reading. In this special report, I'll explain to you how getting the right daily dose of curcumin, along with other key antioxidants, can help save you from having to deal with serious health issues. I advise my readers on a regular basis that taking steps to control inflammation could be the single most important thing you can do to protect your heart, brain and overall health at any age. You see, while inflammation itself is normal, it becomes a problem when triggered by something other than injury or pathogenic invaders. These triggers can include food allergens, toxins, stress, lack of sleep or even the use of some pharmaceutical drugs. And since we're exposed to these triggers on a daily basis, the inflammatory response can stay turned on indefinitely, causing significant harm to the body. 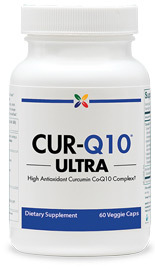 Fortunately, curcumin can help neutralize the harmful effects of the free radicals that can cause inflammation. But that's not all it can do! 1. Cholesterol Imbalances: A growing body of evidence has shown that inflammation triggers increased production of cholesterol. The body attempts to use this waxy substance to protect the lining of blood vessels and arteries from damage, often leading to harmful levels of build-up. 3. Memory Impairment: Research has shown that when the brain is inflamed, memory formation and recall both suffer. Unfortunately, many people start to believe that scattered thoughts and trouble focusing are an inevitable part of aging—but they're not! Silent inflammation is likely the culprit. 5. Aches and Pains: Silent inflammation creates heightened pain sensitivity in the body, as well as common everyday aches and pains in joints and muscles. If your body feels sore and stiff, systemic inflammation is likely to blame. If you're experiencing any of these five symptoms, you need to take action immediately to stem the tide of deterioration that ongoing inflammation can cause. While your symptoms may be mere annoyances now, your heart, brain and overall health could be at serious risk over time. Fortunately, now you can solve this problem naturally, quickly and without side effects. An overwhelming amount of research has shown that curcumin is one of nature's most powerful inflammation fighters, making it a powerful ally for your cardiovascular health. In one notable double-blind, placebo-controlled clinical trial, curcumin slashed blood levels of CRP by an impressive 32%. And a recent meta-analysis came to the same astonishing conclusion: Curcumin lowers levels of CRP dramatically. And another study found that curcumin decreased total cholesterol by 12% and increased HDL cholesterol by 29% in just one week! as Exercise for Your Heart? One study even showed that curcumin was as effective as regular aerobic exercise in improving vascular function in post-menopausal women! A recent double-blind, placebo-controlled study showed curcumin significantly lowered pulse wave velocity, a measurement of arterial stiffness, by 13%. Also, the inflammatory marker leptin decreased by 67%, and triglycerides fell by 47%. And perhaps most impressive of all, a study published in the American Journal of Cardiology found that curcumin reduced the risk of a serious cardiac event (post-bypass surgery) by an amazing 56%! While its effects on cardiovascular health are certainly remarkable, it's curcumin's impressive array of whole-body benefits that have people calling it the "natural remedy of the century." After reading more about this research, you'll understand why. A recent study found that curcumin promotes the production of brain-derived neurotrophic factor (BDNF), a growth hormone responsible for youthful brain function. According to scientists, higher BDNF levels may hold the key to improved memory and sharper thinking as you age. What's more, a recent Australian study found that daily curcumin intake produced short-term memory improvements in adults over 60 who were predisposed to memory loss. It worked like a six-hour memory boost! Curcumin can even support optimal mood balance. A 2014 study showed that it's as effective as a popular mainstream medicine solution for mood support without the potentially dangerous side effects. There is also a mountain of research on curcumin's joint health benefits, but I'll just highlight one landmark 2014 study that really impressed me. It showed that curcumin relieved joint pain as effectively as a popular mainstream approach while reducing stiffness and improving overall joint function—all without side effects. Curcumin's anti-inflammatory benefits may aid in promoting healthy digestion. In one study, curcumin was associated with up to a 25% reduction in digestive discomfort, with two-thirds of participants reporting overall improvement in digestive function. I speak to people all the time who seem to have gotten their inflammation under control, but are still not feeling their best. Why is this? Well, it's important to understand that your body is an incredibly complex machine. And like any machine, it requires energy—LOTS of it. And can you guess which organs require the greatest amount of your energy? It's your heart and your brain, the optimal functioning of which are critical to aging well and feeling your best. This is where curcumin falls short of being a "perfect" remedy: It doesn't do much to support your body's critical energy-producing processes, so the powerful antioxidant CoQ10 comes in to help. While best known for its targeted heart health benefits, CoQ10 is found inside the mitochondria of every cell in your body where it plays a critical role in producing energy. As we age, our body's natural ability to produce CoQ10 declines. By age 70, your natural CoQ10 levels may be 50% lower than they were when you were a young adult! If you aren't taking a CoQ10 supplement, chances are you are already starting to feel the effects of the slow-down in cellular energy production. Statins and other medications can further accelerate CoQ10 loss. With more severe CoQ10 depletion you might experience suboptimal heart function, crushing fatigue, poor concentration, memory problems, irritability, unexplained aches and pains, and a weakened immune system. When you consider the importance of CoQ10 for every cell in your body, and the natural decline in CoQ10 levels as you age—not to mention the accelerated depletion that statins and other medications can cause—taking extra CoQ10 can make a significant difference in staying active and living a long, healthy life. CoQ10 users frequently report noticeable increases in energy, mental clarity, vitality, stamina, and joint and muscle function, which makes it a great complement to curcumin. Virtually everyone can benefit from taking the right curcumin supplement, but there's one big problem: Curcumin is very difficult to absorb, so you have to take enough of it, and in the right formulation, to reap the full benefits. 1. Potency: Look for a turmeric extract standardized to 95% curcuminoids. Many formulas are standardized to only 50%, which is a watered-down level that cheats you of the key curcuminoids shown to have the most effects. 2. Dosage: You need a serving size of at least 1,000 mg daily. Many brands think a mere 50 mg is enough, but you're throwing your money away for such pixie-dust levels. That's only 5% of the levels you need for the optimal cardiovascular, brain and joint benefits you want. Follow these guidelines and curcumin, along with CoQ10, will help support your brain, heart, joints and entire body for a lifetime of health and vitality. I worked with the company's Scientific Advisory Board to create a powerful, all-in-one curcumin formula that had research-based doses of everything you need, including CoQ10, at a price that was half of what many competitors were charging. • 200 mg of Trans-Form CoQ10: This extra-strength dose is bio-identical to the CoQ10 that is produced naturally within your own body, so it is more readily absorbed than the cheaper synthetic forms of CoQ10 you find in most formulas. • 20 mg of BioPerine® Black Pepper Extract: BioPerine® is standardized to contain 95% piperine and is the only brand of black pepper extract that has been shown in research to enhance curcumin absorption by up to 2,000%, and CoQ10 absorption by up to 30%. • Convenience That Can't Be Beat: Just two small veggie capsules per day give you everything you need for fast-acting and long-lasting results. It only takes a few seconds, and you'll feel better than you ever thought possible. • Quality You Can Trust: It's made in Stop Aging Now's own state-of-the-art, FDA-inspected facility located in Florida. Unlike some brands with questionable quality, this is a product with purity you can trust! One of the best parts of my job is reading our customers' remarkable success stories. But you don't have to take my word for it. You can hear from people just like you who had health problems they wanted to resolve the natural way, without side effects or complications. I have much more energy and stamina! 4. Am J Med. 2004 Mar 22;116(6)Supp 1:9-16. 5. Am Heart J. 2004 Jul;148(1 Suppl):S19-26. 6. Int J Biochem Cell Biol. 2009;41(1):40-59. 7. J Neurosci Res. 2004 Mar 15;75(6):742-50. 8. J Pharmacol Exp Ther. 2007 May;321(2):616-25. 9. Biochem Pharmacol. 2005 Sep 1;70(5):700-13. 10. Clin Interv Aging. 2014 Mar 20;9:451-8. 12. J Am Coll Cardiol. 2009 Dec;54(23):2129-2138. 13. Neurobiology of Aging. 2000 Jun 30;21(3):383-421. 14. Prog Neuropsychopharmacol Biol Psychiatry. 2014 Aug 4;53:23-34. 16. Phytother Res. 2014 May;28(5):633-42. 17. Complementary Ther Med 2014;22:851-7. 18. Indian J Physiol Pharmacol. 1992 Oct;36(4):273-5. 20. J Biol Chem. 2001;276(50): 46905-11. 21. Nutr Res. 2012 Oct ;32(10):795-9. 22. J Nutr Biochem 2014;25(2):144-50. 23. Am J Cardiol. 2012 Jul 1;110(1):40-4. doi: 10.1016/j.amjcard.2012.02.043. 24. Stem Cell Research & Therapy. 2014;5(4):100. 25. Asia Pacific Journal of Clinical Nutrition. 2014. 26. Phytother Res. 2014 Apr;28(4):579-585. 27. J Altern Complement Med. 2004;10(6):1015-8. 28. J Am Geriatr Soc. 2007 Jul;55(7):1141-2. 31. Neuropsychiatr Dis Treat. 2009;5:597-610. *Testimonial results not typical. Customers may have received a gift certificate after submitting their testimonial. The information contained above is for general consumer understanding and education, and should not be considered or used as a substitute for medical advice, diagnosis or treatment. This product is not an alternative to any prescription drug. If you are currently taking a prescription drug, consult your doctor before making any changes. These statements have not been evaluated by the Food and Drug Administration. This product is not intended to diagnose, treat, cure or prevent any disease. All contents Copyright 2001-2018 Stop Aging Now, LLC. All rights reserved. Republishing of Stop Aging Now content without written authorization is strictly prohibited.